RandomPottins: We can take care of our enemies, but have to watch out for some "friends"
We can take care of our enemies, but have to watch out for some "friends"
JOSHUA BONEHILL-PAINE. Will he come to London if not 'otherwise detained'? IT had to happen some time, I suppose. After all the excitement over murders in Paris, with Home Secretary Theresa May and local government minister Eric Pickles requiring mosques to prove they belong, and various bigots and provocateurs claiming to protect our freedom, a publicity-seeking young man from Yeovil in Somerset has tried to give the theme a twist by declaring his intention of coming to "liberate" Stamford Hill in north London from Orthodox religious Jews. Announcing his plans on a Facebook page which has since been taken down, 22-year old Joshua Bonehill, aka 'Liberate Stamford Hill', claimed that the religious community's Shomrim (watchmen) protecting synagogues were dressed as police, and enforcing "talmudic law" on the streets, and "white people" who ventured forth were spat upon. ( I guess that means the many black people in the area are safe, or Mr.Bonehill is not concerned what happened to them). In case anyone was too thick to grasp what this was really about (it's not religious restriction and it is certainly not "Zionism",though some comments kept on about that), Bonehill said he was protesting the "Jewification of Great Britain", and illustrated this with caricatured Jews with very long noses. He said he was calling a demonstration on March 22, had asked the police to close off several roads, and that the march would finish with a rally on Clapton Common. the French National Front leader Marine Le Pen. French racists have a tradition of even-handed hatred against Muslims and Jews. The online Hackney Citizen, which quoted Bonehill describing himself as a "proud antisemite", says "He is a member of the far-right National Action party. He has previously supported the Conservative party, then the United Kingdom Independence Party, and the British National Party". Bonehill tried to organise a march in Cardiff last year under the name National British Resistance Party. He has claimed ten 'nationalist' organisations would support his march, though doubters suggest he will be lucky to get ten individuals, and he might just mean he is a member of all ten. Whatever the reality behind his boasts, local people and organisations have promised a hostile reception if he shows his face. Hackney Council has said it is committed to stopping the march from taking place in the borough’s parks. Deputy Mayor, Cllr Sophie Linden said: “This is completely at odds with the long and proud history we have in Hackney of our diverse communities working and living together. Hackney Councillor Michael Desmond called the plans “a pathetic attempt to cause strife in an otherwise peaceful neighbourhood”. A "moronic" hoaxer who claimed a pub had banned military personnel to avoid offending the immigrant population has been given a community order. The Globe, in Leicester, had to close temporarily after people threatened to firebomb the premises and kill or assault staff. Joshua Bonehill-Paine invented the claims on his website the Daily Bale. The unemployed 21-year-old must do 180 hours of unpaid work after admitting a charge of malicious communication. Bonehill-Paine, of Hudson Road, Yeovil, will also be supervised by the probation service for two years. He has described himself as "a rising star of the right-wing community". He appeared at Yeovil Magistrates' Court wearing a union flag tie and accompanied by his mother. 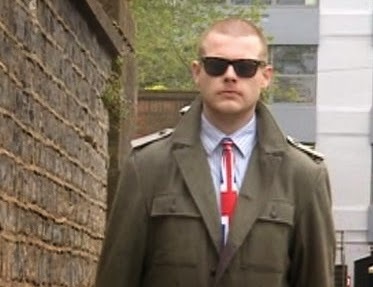 In mitigation, Bonehill-Paine claimed he targeted the pub because he wrongly believed the landlord had been involved in an online hate campaign against him. The magistrates told Bonehill-Paine he was on the cusp of a custodial sentence, but gave him a community sentence after taking his mitigation into account. Graham Cluley, an independent computer security analyst, told the BBC that the Daily Bale is "utterly irresponsible and frankly moronic". Bonehill-Paine and the Daily Bale have been responsible for other false claims published online. Last year his website created a hoax missing person poster, claiming a six-year-old girl had been "kidnapped by an Asian grooming gang". The hoax poster went on to be shared thousands of times on Facebook and Twitter, with many people believing the claim to be true. Another article posted on the website in September falsely claimed an Asian youth had punched a two-month-old baby twice in the face, then thrown the infant against a brick wall in Middlesbrough. It contained a graphic photo of an injured baby. Oddly, this was not the first time the beaks had sentenced Bonehead to community service. A former public schoolboy and Conservative Party member, magistrates sentenced him to a 12 month community order involving 100 hours' unpaid work and supervision by the probation service, following an incident on 11th March 2011 in which he broke into a police station in Chard, Somerset using his Conservative Party membership card, after being kicked out of a hotel for drunkenness. Bonehill-Paine kicked out when efforts were made to arrest him, assaulting two officers in the process. Bonehill-Paine also pleaded guilty to criminal damage to a flower bed in Preston Road, Yeovil, on 30th March 2011. He was found guilty of the offences of burglary, assault and criminal damage. In 2013, Bonehill announced plans to lead a "Stand Strong" march in Woolwich, a month after the murder of Lee Rigby, describing it as a protest against "extremism, terrorism and oppression". Not one to pass an opportunity for spreading alarm, Bonehill ran an exclusive on his website about a 32-year old Somali called Jamal Malouf with Ebola disease disappearing in Leicestershire. That would be quite a story, considering Somalia is the other side of Africa, about 4,000 miles from the areas of the Ebola outbreak. But it seems the reason Malouf was able to disappear so easily was that he never appeared in the first place except on Bonehill's website. Tesco supermarkets on the other hand are real, and that's why Bonehill is due in court in St.Albans this week, charged under S.38 of the Public Order Act 1986, the "contamination of goods", for publishing an article on his website suggesting that fruit and vegetables from Tesco could be infected with Ebola. The offence carries a maximum 10 year sentence. While I doubt whether that's what he'll get, he could be unable to make it for that demonstration in Stamford Hill on March 22. Announcing it in advance might be one way of presenting himself as some kind of leader, and confusing people about the reason he's in trouble. Or it could be a way of diverting attention from the anti-racism march through central London scheduled for 21 March, commemorating the United Nations International Day for the Elimination of Racial Discrimination. This is receiving trade union backing. Hopefully we will not see a repetition of the disgraceful episode in 1949 when a threatened march by Oswald Mosley was the pretext for a blanket ban affecting the May Day march in London,using the Public Order Act. That was by a Labour Home Secretary. If you want to keep and develop fairly good relations between different communities, the last people you'd want around are Britain First, an offshoot from the British National Party, founded by its former fundraiser after he'd made his name amid the flag-waving riots of Belfast. Since mounting its Special Brew Patrols in east London, and march ing on a kebab shop in Cricklewood because it thought the Muslim Brotherhood had its headquarters in the flat above, Britain First has come up with a new gimmick. It is apparently offering to patrol the streets of Golders Green, in north-west London, and protect Jewish people. Some trusting souls unaware of the BF's background may think this a nice,albeit unnecessary gesture. The Community Security Trust (CST), which already handles security for Jewish premises and events, is not so naive, and is advising people to have nothing to do with Britain First. The Jewish Socialists’ Group is committed to fighting all forms of racism including antisemitism, and condemns any attempts to exploit the recent tragic events in France to set Britain’s Jewish and Muslim communities against each other. We call for solidarity between our communities and with all people beyond our communities who oppose racism. We condemn and oppose the activities of Britain First, a split-off from the BNP, who take their name from a slogan popularised by the antisemite and fascist, Sir Oswald Mosley in the 1930s, and we call on Jewish communal organisations to do likewise. Britain First was also the name of the newspaper of the National Front, Britain’s largest far right organisation of the 1970s. The new organisation calling itself Britain First has a record of antagonising and abusing Muslim communities, through its “Christian Street Patrols”. It has leafleted Jewish areas, claiming to support Jews against antisemitism, while actually working to turn Jews against their Muslim neighbours and sow tension all round. It is encouraged by Tory government ministers such as Theresa May and Eric Pickles, who have made unequivocal statements in support of Jews against antisemitism, while calling on Muslims to prove themselves worthy of support by statements of disavowal from actions for which they are not responsible. Theresa May and Eric Pickles are leading members of a government whose policies have marginalised and undermined minorities, migrants and refugees. The Jewish Socialists’ Group is committed to strengthening a Jewish future in pluralist, multicultural societies based on mutual respect, in Britain and elsewhere. We completely reject attempts by Israeli Premier Benjamin Netanyahu to exploit insecurities in an attempt to recruit diaspora Jews to his “demographic wars” in Israel. We will also continue to fight against austerity and inequality in our society, recognising that this provides the breeding ground for racist movements. And finally.... A new group formed on Facebook called Yeovil Against Bonehill says it will liberate the Somerset town from the notorious racialist! What the Frack's Going On? All Souls to Austerity, or 'Gilded Age' for Some?